You have travelled! You have seen places! Brandberg White Lady Lodge in Damaraland will add to your travelexperience through Damaraland. This is our promise. 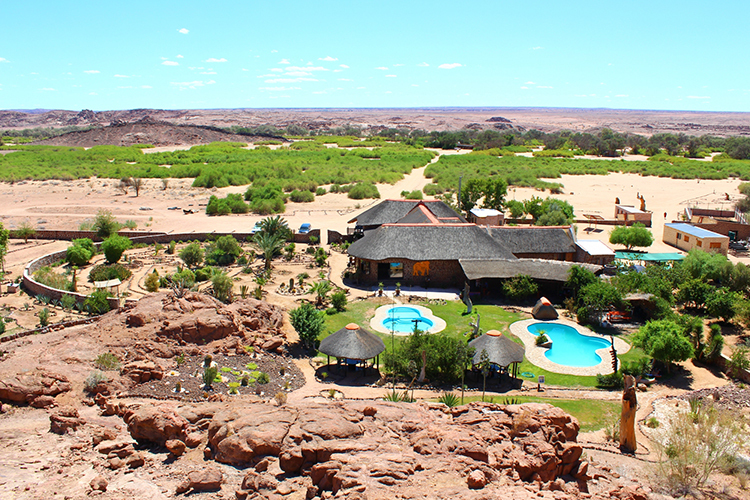 Since its opening in 2002, Brandberg White Lady Lodge has become a destination of choice for nature orientated tourists looking for an experienced guide to take them on a wildlife safari in Damaraland. Our clients visit us from all over the globe not only for our experience and professionalism, but also for our hospitality in the Lodge, the friendliness of our staff and the tranquility of the Damaraland Camp. Brandberg White Lady Lodge in Damaraland is a place where you will feel at home and enjoy a true warm-hearted hospitality and friendship. Whether you camp or stay in a chalet - there will be nothing you'll miss. Here, at the foot of Namibias highest Mountain, nothing has changed since the earth's early days. Clocks, cellphones and watches are not part of this world. Here, you have got time. "Tranquility" is name of the game. At the Lodge you will find a dining area, serving cuisine with the "esprit" of the area, a well stocked Bar, a Lounge and a large Pool area with two swimming pools.